Pallet racking systems are many and varied. Understanding what kind of racking is right for your operation takes a good amount of research. This guide breaks down the different types, and explains how each is used. Every warehouse is unique. Day in and day out, you face problems specific to your facility and are in constant search for better solutions to satisfy your current needs. When it comes to storage, there is a simple reality: one size pallet rack does not fit all. Using the pallet rack best suited for your warehouse environment can ensure you are operating at the most efficient level possible. The right rack can mean higher cost savings, better time management, and increased safety. Understanding all of your options when deciding which racking system is most suitable for your needs is an essential first step in optimizing your workplace. Below is a selection of several of the most popular options that can set you on the right track for better storage within your facility. For fast-paced warehouses with high volume storage (e.g. large cold storage facilities, beverage distributors, food handling facilities, etc. ), structural pallet rack will likely be your best option. Made from hot-rolled structural steel, these racks can handle more pounds per square inch and can endure higher impact from forklift equipment. Retail stores and warehouses that store lighter weight products are ideal candidates for roll formed pallet pack. Produced from cold roll-formed steel, these racks are less expensive than structural rack. This lower cost allows for a more up-front return on investment while providing adequate strength for most general applications. Available in a wide variety of sizes and capacities, cantilever racking provides storage options for longer, oddly-sized materials. Noted for its ease of installation and rugged durability, this style of rack is generally available in different styles such as standard and heavy-duty. 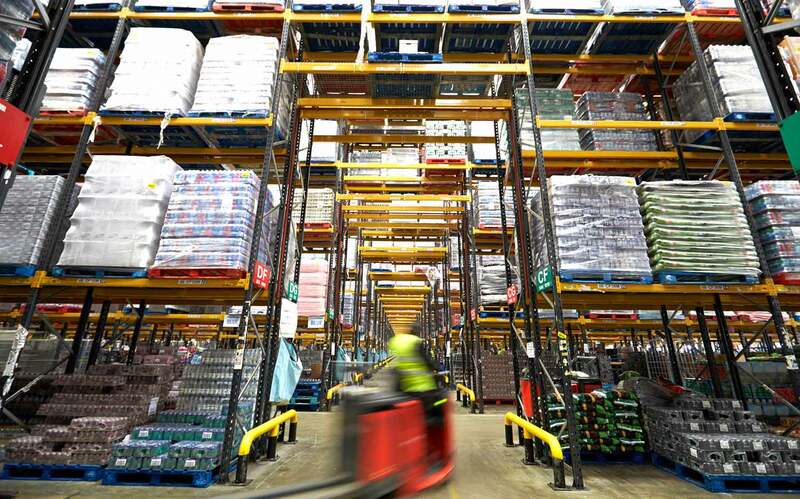 Made for high density storage, pallet flow racking provides a first in, first out system. Ideal for time sensitive products and a limited number of stock keeping units (SKUs), gravity rollers transport pallet down to the picking side. A braking system is generally present on systems more than three pallets deep. Another high density storage solution, push back racking is a last in, first out system. What makes this system especially unique is that each lane and level can be accessed independently. This means multiple SKUs can be stored, ultimately providing greater selectivity. A high density storage solution, drive-in pallet racking works well in situations with limited numbers of product SKUs such as food or product manufactures. In this system, standardized pallets are required, working as last in, first out. Generally, this is the lowest cost option of the other high density systems. Making a strategic plan early on when deciding the layout of your warehouse storage is essential to positioning your facility for maximum efficiency. This will allow you to get the most possible space out of your warehouse. First things first, you should know your budget and exactly how much you are capable of spending. From there you should truly study your warehouse and decide which of the above options is best suited for your facility. Once you decide on which racking system, a rule of thumb to keep in mind is to avoid placing your racks against walls. You want your forklifts to be able to access either side of the racks to maximize your ability to move inventory. It is also not a bad idea to anchor your racking to the warehouse floor—bolts ranging from 3.5 to 4.5 inches in most instances should do the job. The moment you notice damage to a pallet rack, you should immediately repair or replace the rack. Pallet racks often need to withstand loads weighing thousands of pounds, so it’s not worth risking the safety of your team by keeping damaged racks on the floor. As prevention, investing in guards and plates to protect uprights and front columns from damage and/or twisting is recommended. Want to learn more about your pallet racking options? We’re here to help. Contact us to learn more about the pallet racking systems listed above, all available from Carolina Handling—we also offer rack repair and prevention options.